With a score of 175.93, K. Mehl’s Aberdeenshire trophy took top honours for Scotland in 2017, maintaining that county’s place as one of the country’s great roe hunting territories. However, this year it was eclipsed, numerically at least, in the top 10 heads by its principal competitors, Angus, Fife and Perthshire. Overall, the buck season proved an interesting one and though there were no elusive 200-point trophies recorded, stalkers across the country should be satisfied with the total of 254 medal heads out of the 301 roe that were submitted for evaluation. 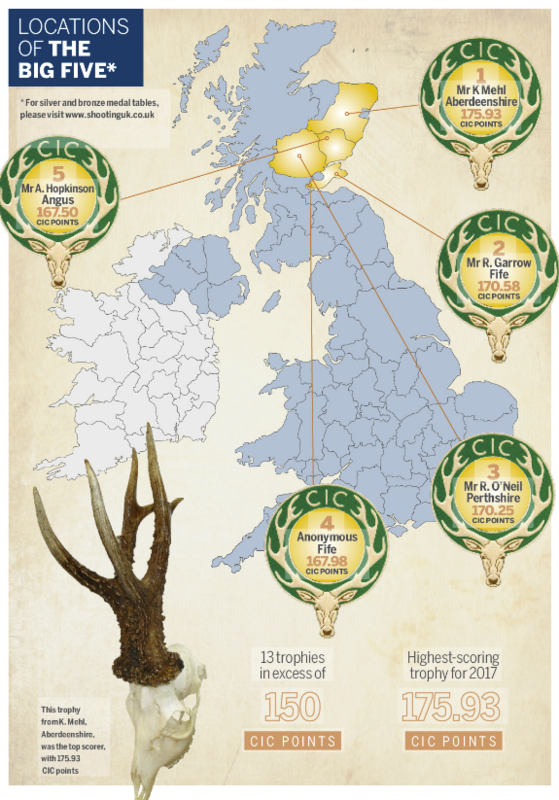 Thirteen Scottish trophies scored in excess of 150 CIC points, long regarded as the benchmark of an international-class trophy, exceeding as it does the gold medal requirement by 20 points. It is always heartening to see that the majority of names cropping up in the medal tables belong to home-based stalkers, as their continuing interest in our native deer bodes well for the future in terms of management and conservation. Looking at the figures on the Trophy Evaluation Database, the system the CIC uses to maintain the records at its Budapest headquarters, there were 61 gold, 97 silver and 96 bronze medal awards made. An unusual feature of the Stirlingshire trophy taken by Mr L. Littlejohn was the swelling of the upper beams, particularly towards the tip of the left-hand beam, scoring 147.38. The trophy also was adorned with additional points front and rear. Another head with an additional point, this time on the upper left below the back tine, was Mr A. Jackson’s from Perthshire, a gold medal at 151.35 points. Many stalkers will now know that the current CIC evaluation method for roe assesses tine length and the 140.25 trophy submitted by G. Paterson illustrates the characteristics looked for, with strong, well-defined tines front and rear. A beautifully pearled example can be seen in Mr Harrison’s Tayside trophy (132.08). The pearling is strong over the whole trophy and extends high on the beams. At the other end of the medal scale, highlighting the importance of consistent scoring and the rigorous application of the rules of measurement, were eight bronze medal trophies, which achieved the medal award by less than 0.5 of one point. Mention here has to go to Mr A. Potts whose Ayrshire buck made the minimum requirement of 105.00. The first major expansion of the Scottish measuring team for a number of years took place at the beginning of 2018. This was in direct response to feedback from stalkers, who asked for easier access to qualified measurers. After successful completion of a training course, four newly appointed certified CIC measurers began operating across the north-east, Borders and Inverness-shire. As is often the case, enthusiasm and increased stalking effort resulted in significant numbers of animals being targeted in the opening weeks of the season, many in the first few days. There has also been a steady rise in the use of thermal-imaging equipment among recreational as well as professional stalkers. With a winter that was less intrusive than the one we have just seen pass, the early consensus was that animals had come through in decent condition and that the survival rate among the previous year’s fawns was high. Wet weather does, however, have a sapping effect on our deer, and for those who see themselves as managers it is worth bearing in mind that the first flush of grass can have a deprecating effect on animals that have navigated the extremes of a long winter. Stalkers tend to be great observers, and reports of early cleaning turn up from season to season. Often much is made of this and from time to time it is claimed by some to represent an indication of what is to come. However, experience over a number of seasons would suggest that this is often not really the case. The roebuck, like other antlered deer, will shed his covering of velvet when his antlers have stopped growing and the blood supply that has been feeding the process has died back. This, along with other physiological and hormonal drops, will take place over a period of time. While it is true that we can expect young animals to be in velvet well after the opening of the season, the opposite doesn’t apply to old animals being clean of velvet long before the clocks go forward. As in any year, it is not just the big trophy heads that attract attention. Perruques have long fascinated and repulsed deer people in equal measure. Less common is the occurrence of coalesced heads. The term describes a head where the main beams are fused together, normally below the brow or fighting tine. In true examples it is not only the beams that are fused but also the pedicles, so that what were two separate pedicles become fused and in effect produce a single antler that is cast as one piece. A notable example turned up from Blairgowrie a number of years ago where the owner, Ian Robertson, was fortunate enough to have shot one and to have found the cast joined antler from the year before. Often these coalesced heads are not very large in trophy terms, but they are invariably old or very old. One from 2017 showed exceptionally worn lower teeth, to the point that it has to rank alongside the oldest roe shot in Scotland. As with the rest of the country, the most significant change affecting trophy evaluation was the decision by the International Trophy Evaluation Board of the CIC to reduce the drying-out time required for trophies from 90 days after cleaning to 30 days. This clearly has implications for all of us who have an interest in deer trophies. In particular, it means that many more 2018 trophies will be eligible for evaluation at the Scone Game Fair this coming July. The decision to reduce the drying requirement came after considerable evaluation of data relating to a sample of trophies and in particular looked at the amount of moisture retained by heads on full skulls. For bronze, silver and gold medal tables, click here. Starting with the Deerstalking Fair in March, the CIC team will be at Scone and Moy with the Scottish Gamekeepers Association, and available by phone and email at all other times. Good hunting to all.